*DISCLOSURE* Thank you to Little Acre Gourmet for providing product samples in order to facilitate this post. All thoughts are strictly my own. This gourmet Three Pepper Ketchup is gluten free and contains absolutely no corn syrup which means it has 50% less sugar than ordinary ketchup; only 2 grams of sugar per tablespoon. 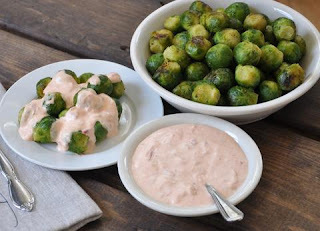 It's kind of like what would happen if you mixed together plain ketchup, cocktail sauce and hot sauce and can be used as a dip or topping on pretty much anything savory. This ketchup is super versatile and comes in three levels of heat...Original, Spicy and More Spicy. None of them were super spicy for our tasty, but we like things spicy around here. The spicy versions do have a little extra kick though. Use this sauce on roasted brussel sprouts or try dipping artichokes leaves in it. Great as a dip for fresh veggies or crackers too! Add all ingredients to bowl and mix. Refrigerate for an hour or more. Serve with veggies, fresh or roasted, or crackers. 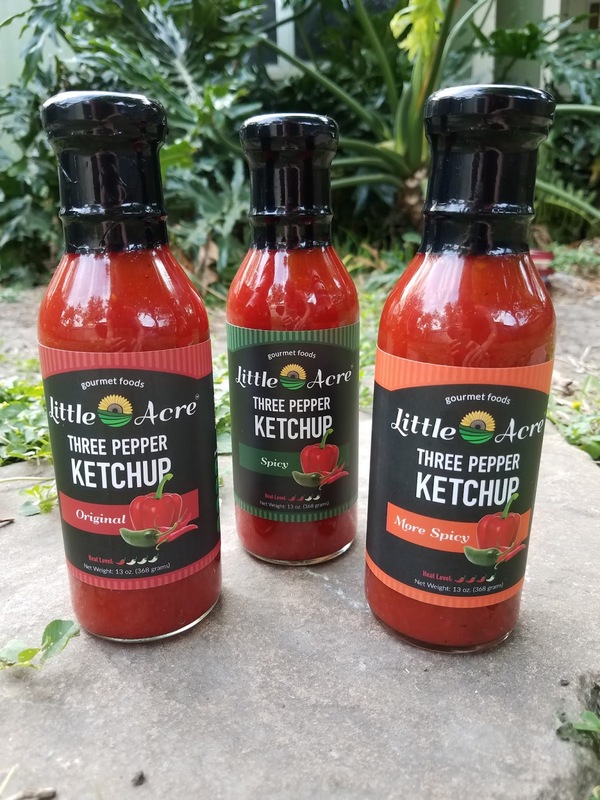 If you are looking for a ketchup with less "sweet" and more flavor, Three Pepper Ketchup from Little Acre Gourmet is one to check out! One ABCD Diaries reader will win a three pack of ketchup from Little Acre Gourmet!